We sing together every Tuesday from 6:00 – 7:00 and sometimes it’s a drag. Some weeks, there are people who haven’t had time to practice the new music, and so we’re stumbling through pieces we were supposed to simply review. Some weeks, half the choir is suffering from the latest bug to pass through town, and there’s more hacking and sneezing than beautiful tones coming from the rehearsal room. And some weeks, many of us are distracted by the various responsibilities and demands of jobs and family and other volunteer work we have to do, and so we keep stumbling over the same easy lines of music just because our brains aren’t working. And then there are weeks like this one. We held our very first Arizona Mountain Chorale concert last night. 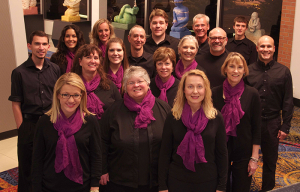 In the past, we’ve just performed a couple of songs as part of Master Chorale of Flagstaff concerts. But this time, it was all us. And we shifted into high gear. I don’t know whether we were all terrified or excited or both, but whatever the motivation, we got down to work. We shifted our schedules so we could add extra rehearsals. (I even delayed going out of town for my birthday to attend an extra rehearsal!) We spent hours at home going over those trouble spots – the tricky rhythms, the challenging harmonies, the dynamics that surprise us on the page turns. Every time we gathered together to get ready for our show, we were intense. And we were together. And that’s what made last night so amazing for me. Did we get all the rhythms right? No. Did we smooth out all the pitch problems? No. But when we sang, we sang as one voice. We swayed to Cuban beat. We jammed on the spirituals. We floated the motets. Throughout the concert, there was a spirit of unity that swept me up. My voice was made stronger by all the other voices. My effort was increased by all the others offering their efforts. My passion for the music and the message was multiplied because I was not alone. I was with my people. Today, I’m so filled with gratitude for this group. I am amazed at what we can do when we work together. I am surprised by the relationships that have deepened simply by sharing our talents with one another. And I am grateful for the opportunity to make music with my voice and my body and share that gift with the world. I found abundant life in the striving towards a goal and in the finished product of a performance well received. But mostly I discovered abundant life in relationships forged through music, strengthened by the camaraderie of singing.